If the dinosaurs in Jurassic Park looked like this it would have been an entirely different movie. Everyone would have just become friends and had a tea party and whatnot. Probably would have played some board games, had a book club, listened to the new Decemberists album. Would have been a pretty chill place. 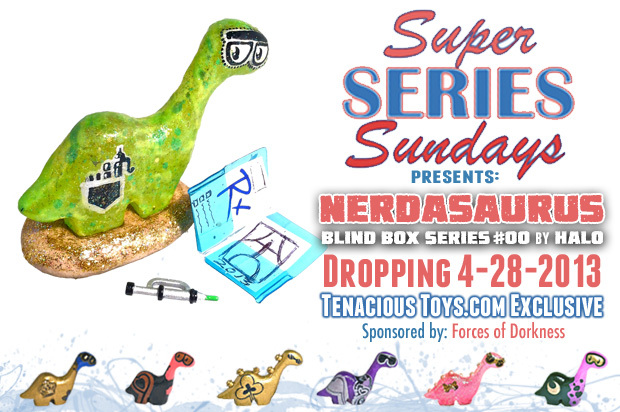 These Nerdasaurus blind boxes will be going on sale tomorrow on www.tenacioustoys.com. They were created by Halo Seraphim and cast by Scott Kinnebrew. And they're cute. Not everything can be skulls and Norwegian black metal. Not until I am emperor anyway.